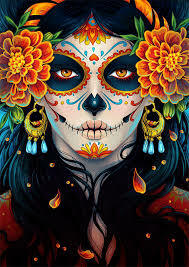 Honouring The Day of The Dead! Giving thanks for this day of remembering our Ancestors! Of remembering all those you have walked before us, so we can be here now and experience life! Giving thanks for the lives you have lead, the sacrifices you have made, the joys you have felt, the challenges you have faced and the love you have given. Honouring you all today, and all the wisdom, talents and gifts you have passed down the line, over and over again! Sending you love and gratitude for the gift of life! Wishing all friends and loved ones a magical night as veil between worlds becomes so thin! What will you ‘see’ tonight!!!! ← Our Tribe is Growing!!! Welcoming 5 Beautiful New Shamanic Trance Dance Guide and Guardians! Aho!